Today only: Free shipping on all Man-Up merchandise!! To qualify for this free shipping offer, one or more Zazzle products must be purchased. Enter promo code FREESHIP2DAY at checkout to receive the free shipping. The free shipping offer is for ground shipping to U.S. addresses only. Shipping charges will apply to oversized orders and orders being shipped on an expedited basis or outside the U.S. Offer is valid from November 30, 2009 through November 30, 2009 at 11:59pm PT. This promotional offer may not combine with any other Zazzle promotional or volume discount offers. Offer valid on Zazzle.com only. Dana: Having my wisdom teeth out during Thanksgiving break when no man-up trips were planned! Russell: My freedom to not be constrained by teeth issues so I can eat all the Texas BBQ for Turkey Day I want! Drew: Free iced-tea refills; wherever you can smoke cigars indoors; any Man-Up review by Bo or Travis; people who follow the rule that the left side of an airport moving walkway is for walking, not standing; peanut butter and multi-grain saltine crackers; the fact that Russell doesn't have an inside voice; The Wall Street Journal crossword puzzle. Mark: Vacuum tumblers and people who make me food. Todd: An extended battery so I can read Riley's review from Snow's and that Obama only has 1150 days left in office. Travis: Bo, and everything that he knows; Russell, and his fashion sense, which includes his ability to wear a head-mounted lamp with any get-up; Drew, and his ability to make smoking a cigar whilst working through a crossword puzzle a refined activity; Brad’s beard and his writing bicycle directions on hands; Chipotle; Mark Dalton marrying up, like I did; Todd Plunk, because he throws more Conservative bombs on Facebook than anyone I know; Dana’s missing wisdom teeth; Rogaine. Man Up: Our blog readers, Facebook group members, Twitter followers, cows, pigs, chickens, turkeys, and everyone who cooks and serves Texas BBQ. Well, clear your schedules, folks, because this review is, unlike me, not short. I guess it’s fitting that this is out longest review ever, considering this outing set a Man-Up record: 18 people. Getting 18 people to any outing is impressive enough, but getting 18 people to leave town at 8 a.m. on a Saturday morning and travel 54 miles to eat BBQ at 9 a.m. is straight strong. If that doesn’t quality as manning up, what does? A few thoughts of my own, before getting to all the reviews and scores: Kerry and everyone at Snow’s were great hosts, as always. I think I speak for everyone when I say that it was enjoyable sitting around chatting with Kerry – and swapping koozies! The chicken was, again, very good; the brisket (of which I had just 1 bite) was even better; but the pork stole the show. I got the first (outside) cut of a pork shoulder just in from the smoker, and it was truly phenomenal. Piping hot, smoky flavor, a slight, crispy outside layer, with a soft, moist inside. To me, the best bite of the day, although you could (and some will) make a case for some other items. If you’ve never had outstanding Texas BBQ first thing in the morning, do it once, before you die. This outing was simply outstanding: a beautiful, early-morning drive to meet a big group of friends in a tiny Texas town for top-notch Texas BBQ. Other than perpetual World Series championships for the Red Sox and the ability to smoke cigars anywhere you please, what more can you ask for? Mark weighs in: "Brisket: never had better. They were juicy, tender, and delicious from start to finish. I didn't even realize til I was almost done that I hadn't used any sauce... no need to! Sauce: very good, but the brisket was so good by itself that the sauce didn't do too much to enhance it. Tasted great with the chicken, though. Chicken: again, some of the best I've had, but it wasn't very big, so not that meaty. 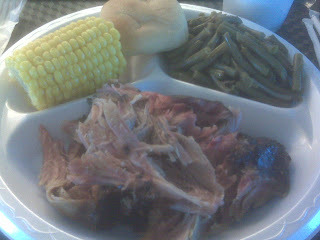 But what meat there was was peppered just right and flavorful throughout. Iced tea: really good tea, but it's still not Big Red. Big Red = BBQ tradition. Environment: ots of my favorite peeps, all coming together and driving an hour and a half out of the way to enjoy some great food. Sat outside next to the pit and soaked up some good smells while we ate. Several of us brought dogs and let 'em run around. Also ran into my ConLaw professor from law school. Overall: I think last time I gave it a 9.95, but I started to second-guess giving it such a high score as I tried other places. Not only do I not regret that score now, but I think it wasn't quite high enough. I dare anyone in the state to beat this place." “Seeing as how I'd already been to Snow's, I'll refer back to my original scoring of Snow's when Jason, Russell and I went. There are a couple of adjustments though since circumstances change. Brisket - Previous review: 9.93. I'm going to go ahead and come clean by saying that brisket is not my favorite BBQ meat. However, I do know it's the hardest to cook well, so I appreciate a good one. I also know that this brisket was maybe the best I've ever had (although I've never been to Louie Mueller's). 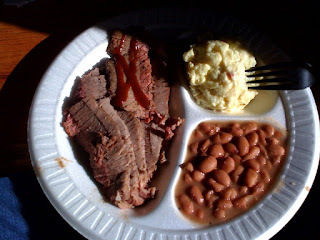 I've had plenty of brisket that falls more on the dry side, but that wasn't the case at Snow's. It was so tender that when I reached to get some from the tray with my fork, it would fall apart where I stabbed at it. That's how tender it was. It was also incredibly moist and flavorful throughout and perfectly cooked on the outside. Current review: I've been to Louie Mueller's since the original writing. And Snow's is better than Louie Mueller's. After eating the brisket again, I feel my original 9.93 score is low (which is crazy to consider). The best part is that it melts in your mouth and tastes incredible, but then that second kick where the smokiness and full flavor comes out happens and you can't help but acknowledge that Snow's is the best brisket ever consumed. Pork - Previous review: 9.79. I put some on my plate/butcher paper and was skeptical. At first glance it looked dry, slightly tough and a little bland, but that changed once I actually tasted it. Not only was it surprisingly moist, but the flavor of the pork stayed and it was tender. Not as tender as the brisket, but it was still my second favorite of the day. Current review: That all is still true. Originally I graded it a 9.79, but I think the pork was more moist than my first trip to Snow's and seemed to have better flavor. It really was a great cut of meat. Pork Ribs - Previous review: 8.9. The pork ribs actually disappointed me. The first bite I took was dry and not very good, although every other bite I took tasted fine. The difference is that while it tasted good, it didn't taste exceptional. Probably the worst meat we had. Current review: No need to change the rating, although I feel bad for saying the pork ribs were the worst meat I had on my first visit. I think the pork ribs suffer from being overshadowed by the pork and brisket, which is a shame. They're good, but they're just not awesome. Plus I got a cross cut of the ribs to where I had several bones instead of just one to work around, so that made it slightly annoyingly more difficult to eat than normal. Sausage/Chicken: N/A. 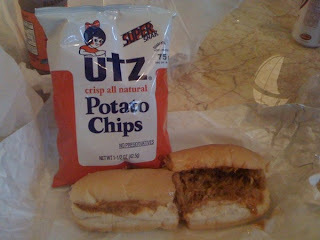 After rereading my reviews of the sausage and chicken, I'm disappointed I didn't have any of either on the second visit. Especially since I think I helped convince Leticia that the sausage wasn't worth getting. Whoops. Sorry about that one. Guess we'll have to go to Snow's again at some point to make up for that. Dr. Pepper - Previous review: 10. I had a Dr. Pepper instead of tea because I love Dr. Pepper. It's the beverage of Texas and always delicious. Plus the can matched well with the meats on the tray. Current review: I mean, it's Dr. Pepper. It might be the best drink on this planet. Beans - Previous review: 9.86. I grew up eating pinto beans, fried potatoes and cornbread almost every Saturday because my parents are both from rural north Texas and like to cook. That was our easy, go-to Saturday night meal. As a result, I feel like I know what makes pinto beans good or not. There are a couple of key things. The first is that the juice can't be too thin. It needs to be thick and slightly soupy, not brothy. The second is that it must have bacon, but the bacon needs to be cut small enough to where it doesn't get in the way of your spoon as you're trying to get to the beans. Snow's nailed both of these perfectly. The consistency was the right thickness, and I had no issues with pulling my spoon out only to find some chunk of bacon or meat in place of beans. The beans could probably have had just a touch more flavor, but combined with everything you really couldn't ask for much more out of pinto beans. Plus they're free. Current review: That all still holds. Weirdly enough, I think House Park has the best beans I've had (weird because their brisket and pork tenderloin are both horrible cuts of meat not worth ordering). Have you seen the largest turkey smoker in central, if not all, of Texas? It will be at the Turkey Tailgate tomorrow. We will have 4 competition pit BBQ teams smoking 150 turkeys to glorious perfection. Are your kids helping this year? If so, please bring them down to the Turkey Tailgate. We have plenty of to-go containers for them to decorate. We will get a head start on Thursday with those containers. Kids of all ages will be able to help. Would you like to help at the Turkey Tailgate? Come on down. We will have plenty of things to do to prep for Thanksgiving. Do you have donations? Turkeys must be at the Turkey Tailgate by noon in order to get into the smokers. All other donations can be delivered until 6 PM. Come next Wednesday (December 2), the newest BBQ joint in Austin will be Franklin Barbecue, located at 3421 N I-35 (behind Owl Tree Roasting). If anyone hits it up before we do, shoot us an email, and let us know what you think. And if you wanna follow them on Twitter, here you go. And what's a trip to to the "Heart of Texas" without a picture to show for it? Arrowhead Stadium in Kansas City has long been a standout because it is the barbecue capital of America, August to December. To have eaten ribs or chops here is to have participated in a great time in American culinary history. But the one place that could give Arrowhead’s chefs a run for their money are the grill-masters down at Reliant Stadium, in Houston, where the Texas-style barbecue rules. So, according to ForbesTraveler, Kansas City is the "barbecue capital of America." (Flashback: Battle BBQ: Texas v. Kansas City) Thoughts? Green Mesquite on "Diners, Drive-ins, and Dives"
$5 discount applies to any number of sheets of twenty Zazzle Custom Stamps with a denomination of 44 cents. Enter promo code ZAZZLESTAMPS at checkout to receive discount. Offer is valid from November 23, 2009 through November 26, 2009 at 11:59pm PT. Your order must be placed during that time to qualify for this special offer. This promotional offer may not be combined with any other Zazzle promotional or volume discount offers. Offer valid on Zazzle.com only. Knowing she couldn't top the awesomeness that I just created right in front of her eyes, she mustered the little dignity she had left and started a sandwich of her own. Ha! Puh-leeeeeze. Okay, fine. Her sandwich wasn't all that bad, but I'm deducting points for the healthy dollop of self pity she added. Operation Turkey needs a smoker! Setting up before the "BBQ Bowl"
Southside Market pics from John T.